surround yourself in bohemian, vintage, summer atmospheres at the desu house, one of the most charming and colourful island houses in seminyak. there is no other place like the desu house, featuring unique hand-picked interiors ruled by middle eastern elegance, colonial style and tropical charm. it is one eclectic blend of colors and elements, creating the most exotic holiday home imaginable. just the perfect home away from home for a family or a group of friends seeking a private little bohemian paradise in the heart of bali’s most fashionable and happening beach town. From the arch-shaped doorways, the yellow and orange natural stone walls, the chequerboard floor tiles enriched by soft oriental carpets and the antique, vintage furniture, the desu house is unique and it steals your heart in seconds. 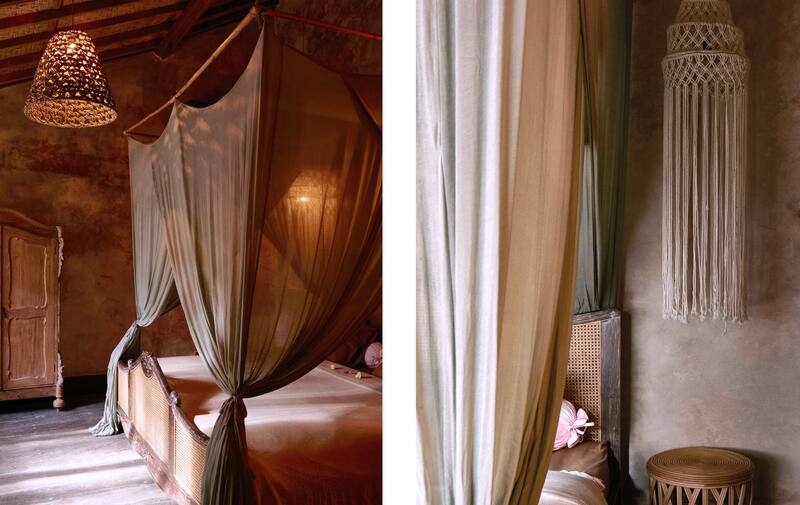 You can easily tell that this seminyak island house was designed with love and care of the owners. The living room is tucked in a traditional Indonesian pavilion with a high soaring rooftop supported by rustic wooden pillars in the living room. beautiful balinese wooden carvings blend in seamlessly with the sophisticated colonial antiques and the middle eastern lanterns, carpets and artifacts. the desu house is not only tropical and exotic but also retro and sophisticated. 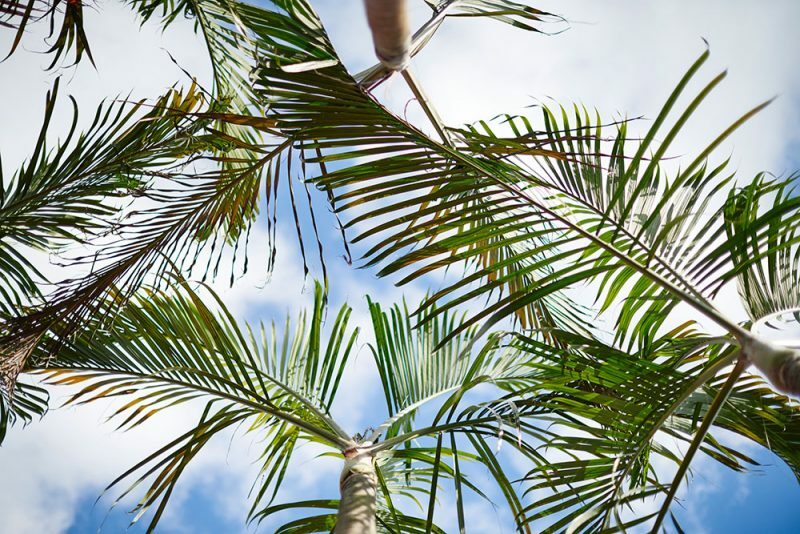 swaying palm trees, lush tropical greenery and flowering plants grow in the garden of the desu house, giving it a feel of a hidden oasis, far away from the buzzing crowds of trendy seminyak. 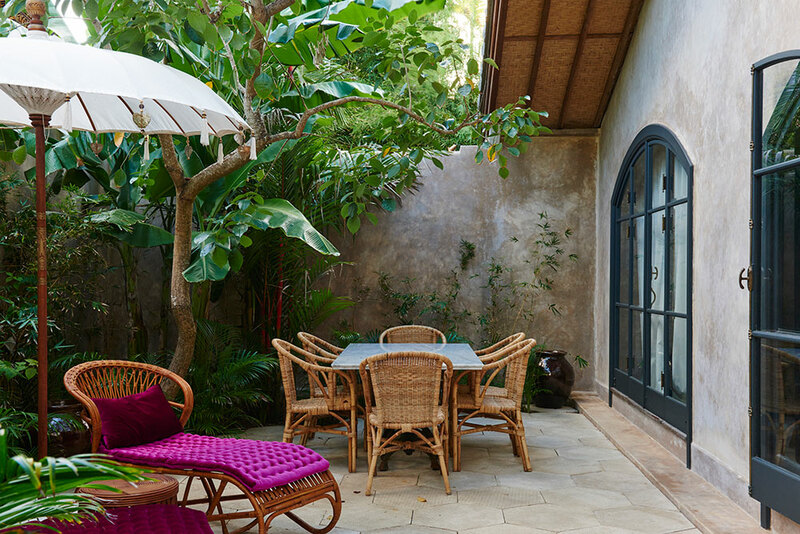 in the heart of the garden glistens the private swimming pool and around it, there are comfy bamboo sun loungers shaded by traditional balinese parasols. lounge the day away and forget about the outside world for a while until you are ready to go explore the lively streets of seminyak. the alfresco dining table invites guests to spend true quality time together friends and family starting in the sunny afternoon until late at night under the starry night sky, sharing a bottle of chilled white wine and snacks in the best company. 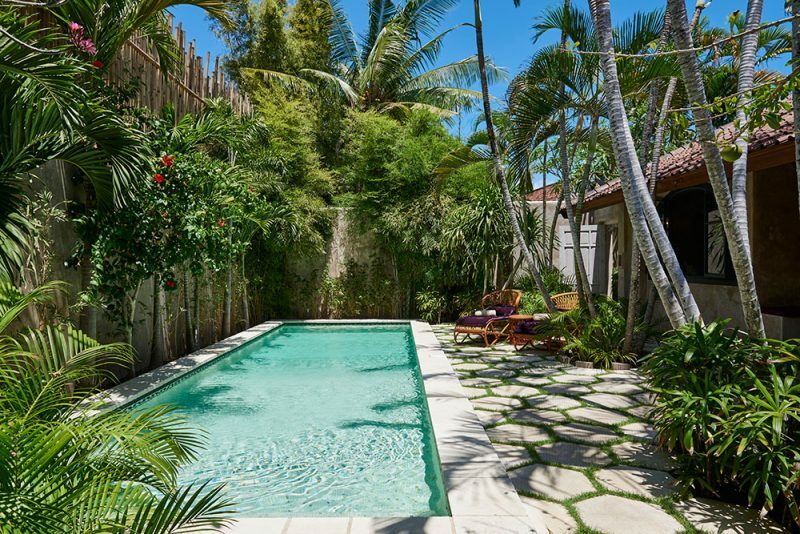 you wouldn’t expect it when snoozing and swimming in the garden of your bohemian paradise retreat, but when walking out of the secluded lane of the island houses, all of seminyak’s trendy coffee bars, boutique shops, high-end restaurants as well as the beach are just a short stroll away. within minutes you can find yourself sipping cocktails at ku de ta beach club or wining and dining on oberoi’s celebrated ‘eat street’. 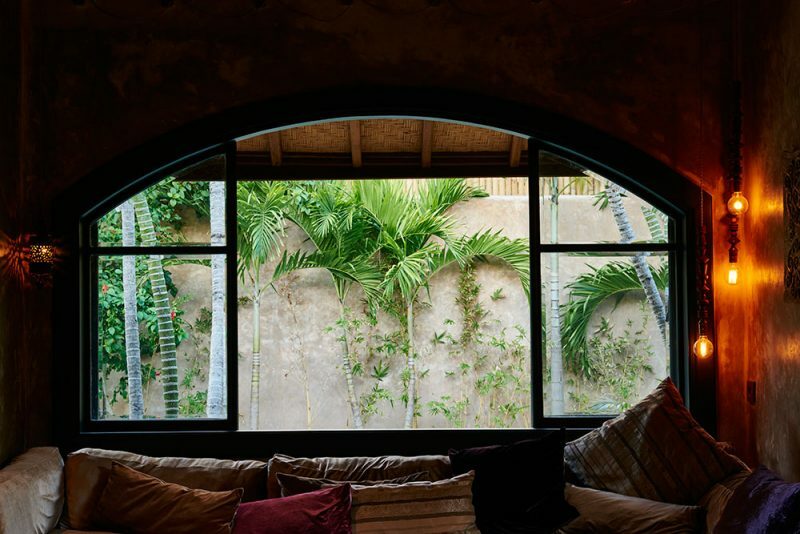 coming home to your tropical hideout in seminyak is blissful every time. the desu house features three opulent villa suites to retreat to at night. each bedroom features air-conditioning and an antique canopied draped in chic custom-designed curtains for a perfect night sleep. 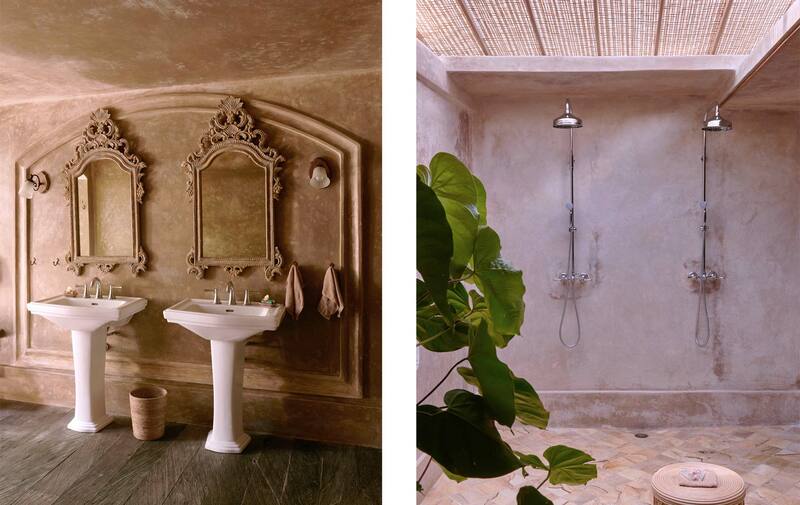 the moroccan-inspired en-suite bathrooms boast colonial-style washbasins and deluxe overhead monsoon rain showers in tropical in-bathroom garden settings. two of these deluxe bedroom suites also feature freestanding colonial bathtubs to soak in at the end of the day.